At Hopkins Dental we will discuss your requirements during a private consultation; from there we can create a personalised dental plan recommending treatments to benefit your smile. We are able to assist with a range of solutions to address problems resulting from injury, discolouration, inherited traits or the breakdown of previous repairs. There’s no doubt about it: regular, white teeth contribute to an attractive smile. Professional cleaning by your dentist will often be all that is needed to treat stains or discolouration. However, in some cases we may suggest bleaching as an additional treatment. Bleaching is a treatment you can perform yourself at home, working in conjunction with your dentist to ensure you achieve the results you want. 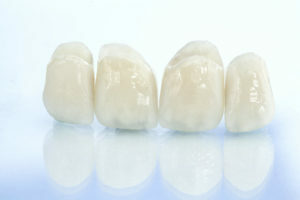 A custom made mouth-tray is constructed to contain the bleaching gel and keep it perfectly in contact with your teeth. Your dentist will prescribe the length of time you need to wear the mouth tray each day and the number of days you need to wear it, to ensure the treatment is safe and effective. Bonding is a technique typically used to treat small irregularities such as chipped teeth. It’s a four-step process. First, the affected tooth is etched with an etching gel, a chemical process equivalent to roughing up the surface with sandpaper in preparation for painting. Second, a bonding liquid is applied to the tooth (think of it as applying a primer). Third, a tooth-coloured putty-like resin is applied to repair the tooth. Finally, the resin is shaped and trimmed to its final form. Porcelain veneers can be used to improve the appearance of misshapen, discoloured, chipped or misaligned teeth, including gaps between the teeth. These wafer-thin ceramic shells are custom-made in process that involves two appointments.